The best way to prepare for the TRUTH that will soon be revealed is to activate your consciousness out of the third dimensional lies and into the fifth dimensional honesty. In doing so, you will need to clear your own fourth dimensional aura, which connects the portals of our third and fifth dimensional self. Most important, as you clear your human fourth dimensional aura, you will also clear Gaia’s fourth dimensional aura. When your aura is not clear, you cannot clearly perceive your fifth dimensional SELF or your fifth-dimensional environment. In the same manner, when Gaia’s fourth dimensional aura is unclear, She cannot perceive Her fifth-dimensional New Earth. Since humanity is primarily responsible for the darkness (fear) in Gaia’s aura, humanity is being called on to clear their fourth dimensional aura. In this manner, humanity will assist in clearing Gaia’s fourth dimensional aura. You, meaning all of you wearing a third dimensional earth vessel, can deeply clear your aura by consciously working your way through each of the sub-planes on the fourth dimension. Your reward for that journey is that you can then study at the Mystery Schools on the highest frequency of each sub-plane. This journey is one that you have taken in all your spiritual incarnations. Of course, the concept of death is limited to the third dimension. Since the fourth dimension is where you have often gone after many of your “deaths,” you will find myriad remnants of your self within that dimension. These fragments of your self are ready to join you on your return to your fifth dimensional Lightbody. Some of these remnants of your true SELF have become trapped in the fourth dimensional Lower Astral Plane. Therefore, armed with your unconditional love and Violet Fire, you will seek out these lost pieces of the puzzle of your Multidimensional SELF. Your challenge will be to remember to call upon your Inner Guides, as well as your myriad higher expressions of SELF, to assist you on this journey. Most important, your own Multidimensional SELF will assist you as you work your way through the Mystery Schools of the fourth dimension, and into the frequency of your fifth dimensional Lightbody SELF. Your fifth dimensional SELF will also be guiding you, but only when you remember to include it. You will first move through the Lower Astral Plane where you will collect the distorted resonance patterns of your long- forgotten wounded ones. Then, you will take them with you to the Violet Temple at the highest resonance of the Lower Astral Mystery School to be healed. In this manner, you will clear not only your current resistance to change, but also any resistance to change in all of the incarnations you have ever taken on the body of Gaia. As you clear your own fear-based residues that you have left on Gaia, you also clear Gaia’s Earth. Of course, it will take a large number of humans to assist with Gaia’s clean up, but it must start with some one. Hence, that “someone” may as well be YOU. Fortunately, you will not be alone, and you shall each contribute greatly to this service based on Unity Consciousness. As you cleanse the fourth dimensions of your wounded expressions from myriad incarnations, you create a fourth dimensional highway to the cusp of the fifth dimension. Within the same NOW, your grounded, Earth vessel is also preparing for “The Call” of Truth that you are consistently receiving. You are being “called on” to tell the Truth in a reality based on lies and illusions. Telling, or accepting, the Truth in a world filled with fear and lies will be extremely difficult for many to accept. Therefore, those of you who have long known this truth and have patiently, or impatiently, awaited its release for decades, will need to clear your own fears that you have hidden in your fourth dimensional, unconscious self. As you continue your journey and visit each fourth dimensional Mystery Schools, you will transmute the lies that were told to you. Then, by allowing the dawning light of TRUTH to guide you to your chosen destiny, you will continue on your way to merge with your own higher dimensional expression that awaits you within the fifth-dimensional NOW. Within the NOW, you are not concerned about when, where, or how. Within the NOW, your fourth dimensional and beyond consciousness, serves as an open portals through which the TRUTH, as received from your own higher expressions, will flow into your third dimensional world. That “Flow” travels through you to guide your journey within the NOW of each breath, thought, and emotion. This Flow will remind you to allow your breath to constantly align you with your Higher SELF so that you can lovingly welcome all lost fragments of your fourth dimensional self into your High Heart. As if the above undertaking is not enough, we will also need to carry on with your myriad 3D lives, jobs, families, and obligations. It is for these reasons that you have had to heal and prepare for so many years. NOW the waiting is over, because if you are “waiting,” you are NOT “doing.” As you move through the clearing of your fourth dimensional secrets, you will find old angers, fears, and sorrows calling you to love them free forever. This journey is not for everyone. It is a journey for those of you who can expand your consciousness beyond your own personal self, and remember that you entered this incarnation in order to assist Gaia. As you move through the fourth dimensional Mystery Schools, you will do so for Gaia. You are no longer the individual beings who must become who society has told you to be. YOU are NOW your Multidimensional SELF who remembers WHO you are and WHY you came into this embodiment. But first, you must release the fourth dimensional fears and traumas that you have hidden in the lower astral plane from your fourth dimensional self. As you clear and heal the secrets you have kept from your self, you will find that it becomes easier and easier to BE your SELF. Can you face the truth that so much of what you have been told has been a lie? Can you face the lies that you have told your self so that you could live in a reality based on lies? Can you heal the YOU that you had to become in order to survive in that reality? The answer is YES! If you have the courage to look deeply into your own fears and disappointments, you will find the courage to BE your SELF – no matter what. This inner power will begin with a few, than exponentially expand into the many. YOU, the ones who are awakened and are ready to become leaders, will initiate this process. However, first you must lead your self on an inner journey to heal, prepare, and expand your own perceptions of SELF. Then, you can change your perceptions of daily reality. These daily perceptions are greatly influenced by your fourth dimensional self, who is mostly “unconscious” to your waking, 3D brain. Therefore, once you can bring your fourth dimensional consciousness “online” with your third dimensional consciousness, you will fully open the portal to your fifth dimensional Lightbody. Since your Lightbody self is in constant communication with the NOW of ALL your higher expressions, you only have this ONE bridge to cross in order to live within the ONE. You will begin this journey of transmutation by creating a clear portal UP through your fourth dimensional self. Once this portal is created, it will serve as a two-way gateway between your earth vessel self and your fifth dimensional Lightbody. You, our Beloved Ones, have volunteered to take an earth vessel to assist Gaia to close the gap between Her third and fifth dimensional expressions by clearing the fourth dimension. Begin this journey armed with the fact that there is NOTHING in the Universe besides pure spirit. And there NEVER has been. Therefore, you do NOT travel through darkness, but through the third/fourth dimensional illusion of darkness. There are two poles of this Spirit of All That Is. There is the positive—active—directive pole, and the negative—passive—receiving—assimilating pole. All creation is in a state of ever becoming, and perfection is the goal. The positive pole of spirit manifests as energy and the negative pole acts as the receptacle. The two work together to create form. Form is the lower vibration and is brought into being for the use of spirit. Spirit and form evolve side-by-side, as together they merge wisdom, power, spiritual love, and love of spirit into matter. You all have the power of your inner spirit to create something entirely new. Since all reality stems from the core of the Universe, core of the Galaxy, core of the Solar System, core of the planet, and core of the humans, your creations begin within the core of your self and expand outward into your reality. Hence, you cannot create any thing outside of you until you have created it inside of you. 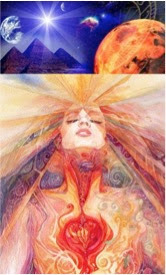 Within the Three Fold Flame of your High Heart, you have the spiritual essence of wisdom, power, and love. These qualities of Spirit resonate to the fifth dimension and beyond. Therefore, your portal into the fifth dimension can be opened via your High Heart. You will begin your journey by entering you own High Heart to search the lower astral plane for any fragments of self that have become lost during your myriad incarnations on planet Earth. With the protection of the wisdom, power, and love within the Three-fold Flame of your High Heart, you will begin your journey by entering your Root Chakra at the base of your spine. As you travel up your spine, you will clear and activate the power of creation within each of the ductless glands of your endocrine system. The adrenal glands of the Root Chakra are the glands for combat because they prepare the human form for change, emergency, combat and/or preparedness. 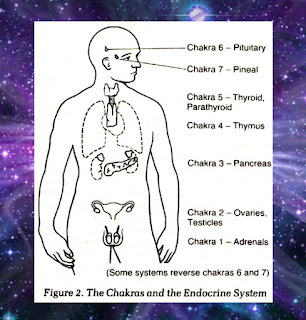 Therefore, these are your “warrior” hormones that activate you into action to fight against the lies and for the truth. As you first enter the Lower Astral Plane via your Root Chakra, the adrenalin coursing through your system prepares to fight your greatest enemy—fear. Fear is why you left portions of your essence behind and why you believed the lies that have filled your world. “Since I love myself unconditionally,” you continue, “I choose to use Blue Sword of Divine Truth to cut through your lies and the Violet Flame to transmute them into Truth.” That truth begins with the acknowledgement that you ARE a multidimensional being who has taken an earth vessel to assist Gaia with Her ascension. You begin your service to Gaia by creating a golden portal of light through the darkness of the Lower Astral Plane through which the great cosmic light can flow into Gaia’s planet. These tunnels of light will also show all the lost ones the Path of Love and the return to their higher expressions of SELF. Through the tunnel of light that YOU have created, you look up to see the Violet Mystery School on the highest frequency of the Lower Astral Plane. You see many of those who surround you also look up to see and feel the love of truth and the truth of love. As they surrender to that love, their dark forms become lighter and lighter, and they follow you into the entrance of the Mystery School. As you enter the School, leading others who now follow you, you feel the warm embrace of your Angels and Guides. Dear Readers, how do you perceive the first Mystery School? Sign up now to attend our final lecture, and you will still receive all three recordings. Please join us and bring all your intuitions, multidimensional ideas, experiences and, most of all, please bring your unconditional love. We the Arcturians welcome you within the NOW of our ONE. "Forge a tunnel of light through the astral plane. As we face, heal, release, and transmute our inner woundings, we help others, as well as the planet, to also heal and transform." ~ The Arcturians. Our second webinar in the Advanced Arcturian Lecture Series allowed us to experience some deep healing. You can still join us for the third and final webinar on Tuesday. Missed the first sessions? You can still sign up and receive recordings of the ones you missed, as well. Thank you for being a pioneer, and bringing this light into the world. Is there a specific meditation (or set of meditations) that you have as a part of your downloads, that you would suggest doing on a daily basis to connect in this way? 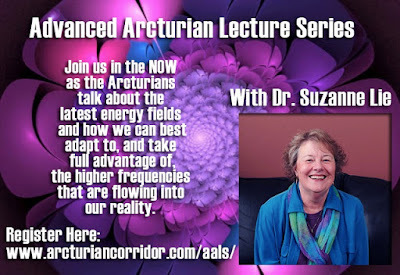 Thank you dear Suzanne and Arcturians for another wonderful message! Becoming ONE-People and Planet "Blog-a-thon"